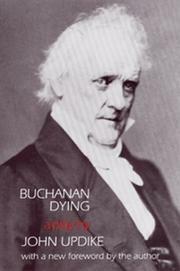 John Updike has made a stalwart attempt to rescue James Buchanan from historical oblivion -- and failed. His play about the last hours of the fifteenth President of the United States offers, alas, a hero who is not so much dying as dramatically dormant. Propped up on bolsters, lying in a sleigh bed at his home in Lancaster, Pennsylvania, fat and old and white, surrounded by the threatening figures and events from a troubled past, quarreling with God, debating with himself, Updike's Buchanan is a sort of recalcitrant Job engulfed by his tormentors. The Civil War three years ended, Buchanan, the predecessor of Lincoln, is conscience-stricken over the duplicity of the North, the bulling of the South ("Once the North could call itself righteous, then human greed could have its space, and the rest was but a long and bloody grinding down"). Flitting in and out of his guilty reveries are the ghosts of Jackson, Lincoln, and the Czarina of Russia, of his mother and his father, of the woman he jilted and the niece he adored. Always a fluent writer, Updike has, naturally, many moments of decorous felicity, but the play seems, nevertheless, to have largely been composed between bouts with the scholars (the political pedantry, the affectedly venerable language) and fretful musings among the works of La Rochefoucauld and Pascal. Buchanan's wan note of misanthropy is emphasized through his highly unusual penchant for French mots (imagine that happening in the Washington of today! ), one of which -- "Il est plus aise de connaitre l'homme en general, que de connaitre un homme en particulier" -- might serve as a fitting clue to the fundamental absence of emotional interest, since the most revealing, intimate touch about Buchanan's character in Updike's dry, cold, statuesque play comes in an early stage direction: "This is the so-called Back Bedroom, preferred by the dying man perhaps because, being over the kitchen, it was warm.